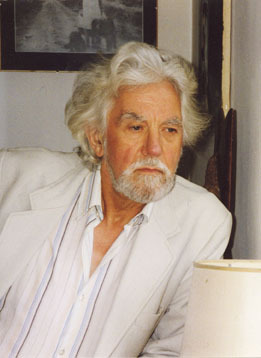 Kenneth Lawson started painting seriously at the age of 16 and at 22 he exhibited alongside the ‘London Group‘ at Burlington House. His work was praised by art critics of the time. In the 40s Kenneth exhibited regularly at major galleries in London including The Redfern Gallery, Cork Street; The Leger Gallery, Bond Street; and The Leicester Gallery, Panton Street. During these early years in Dulwich, Kenneth’s mentor was the RA James Fitton, who remained advisor and friend until his death in 1982. Kenneth also became absorbed in the world of theatre and followed a varied and distinguished theatrical career, working as Scenic Artist and Designer at many prestigious theatres including The Royal Opera House Covent Garden. He also designed seven operas for the South Yorkshire Opera Company at Sheffield’s Crucible Theatre. In 1951 he was approached by Graham Sutherland to assist with the large painting ‘Origins‘ for the Festival of Britain. Kenneth was the only assistant that he ever used. The painting was created at The Tate Gallery, Millbank, and has remained there ever since. In 1952 and 1953 Kenneth worked with Sutherland on the studies for the world’s largest tapestry which was made in France and later installed at Coventry Cathedral. In the mid ’50s Kenneth joined the BBC in Manchester and single handedly created the Design Department there. He worked on many familiar programmes including Top of the Pops for which he was the first set designer. He retired from TV in the early ’80s but continued to live in Manchester (Didsbury) and latterly wintered in Menton. It’s perhaps because of this move into design that Kenneth has managed largely to escape the full attention of the art establishment, and his partner of many years standing, Jean Maudsley, has worked tirelessly since his death to address this anomaly. Public galleries in the North West, including Oldham, Rochdale, Salford and The Whitworth Art Gallery, have been delighted to accept his work. She has also exhibited his work at local Didsbury events as well as selling at auction and through a local gallery where, in 2012, Ken’s work was shown in a joint exhibition with his very good friend John Pegg. They are scheduled to exhibit together again, this time at Stockport AG and with the addition of work by Malcolm Allum, in a show organised by Ken’s partner. It is due to run from mid December (c18th) to January 26th. Kenneth’s work is in private collections in England, mainland Europe and America. Painting was Kenneth’s “first love”. At the age of 14 he began sketching, and painting water colours in the countryside of Surrey and Kent. By the age of 22 he was exhibiting with the ‘London Group’ at Burlington House. Other successful exhibitions followed at major London galleries, including the Leger and the Redfern, his work receiving high praise from art critics of the time. During these early years in Dulwich, Kenneth’s mentor was the R.A. James Fitton, who remained advisor and friend until his death in 1982. Kenneth began work as a Scenic Artist and Designer for many prestigious theatres (including the Royal Opera House, Covent Garden), once being responsible for the settings of three plays running concurrently. Some of his stage designs toured Europe; one of them for “No Orchids for Miss Blandish” is in the V&A. The demands of the theatre took priority and painting became a part-time pursuit. In 1951 he was approached by Graham Sutherland to assist with his large painting “The Origins of the Land” for the Festival of Britain. Kenneth was the only assistant Sutherland ever had. The painting was created at the Tate, Millbank, and has remained there ever since. In 1952 and 1953 Kenneth worked on another project with Sutherland, the drawings for the world’s largest tapestry which was made in France and later installed at Coventry Cathedral. In 1956 Kenneth’s distinguished and varied theatrical career helped to secure him the position of Designer for the BBC North region, based in Manchester. He single-handedly created the Design Department, becoming Senior Designer, and working on the first ‘Top of the Pops’ (1964), ‘The Good Old Days’, the Ken Dodd Variety Show, the Harry Worth and Val Doonican series, ‘Call My Bluff’ and ‘Face the Music’ amongst many other productions. In 1980 Kenneth officially retired but was retained on contract for a while. From 1982 to 1985 he designed seven operas for the South Yorkshire Opera Company at Sheffield’s Crucible Theatre; these included ‘Madame Butterfly’ and ‘Tosca’, at whose gala performance he was introduced to the Price of Wales. It is perhaps because of his move into design that Kenneth has largely managed to escape the full attention of the art establishment. Retirement allowed him to concentrate once again on painting, inspired by visits to Portugal’s Algarve, Madeira and Italy’s Amalfi coast. He painted during his last winters, which were spent in his beloved Menton in the South of France, overlooking the Bay of Garavan with its wide expanse of sea, its particular quality of light and impressive “back-drop” of the Alpes-Maritimes. Since Kenneth’s passing, his partner of many years’ standing, Jean Maudsley, has worked to win the wider recognition that this fine artist deserves. During his life-time, his paintings were shown at Manchester and Salford Art Galleries, including entries in the ‘Laing Collection’ but recently public galleries in the North West (Gallery Oldham, Touchstones Rochdale, Salford Museum and Art Gallery and the Whitworth) have been delighted to accept his work for their permanent collections. Many of Kenneth Lawson’s paintings are in private collections in the U.K., France, Holland and the U.S.A. The University of Manchester’s John Rylands Library contains material related to his life and work.